For the past decade, Swedish hard rock band Crazy Lixx have released a steady stream of quality music. Attempting to bring life to a genre that’s seen better days, Crazy Lixx has not only succeeded in those goals, but currently sits on top the throne as one of the most recognizable modern hair metal bands. After a tumultuous year in 2015, Crazy Lixx has reinvented themselves with a new lineup and has taken a fresh stab at their trademark 80’s style rock n’ roll. And for any of those worried that a lineup change compromises their knack for writing big choruses, catchy guitar riffs, and blazing guitar solos, you can rest assured – this album is good, real good. Ruff Justice kicks off with the dark n’ dirty “Wild Child,” which after the first listen had me reaching for my guitar in an attempt to transcribe the song. I’ve always felt that the difference between “good” music and “great” music is that great music makes you want to get involved. Whether it makes you dance or makes you air drum, it lights a fire that not only gets you involved aurally, but involves you physically. The album continues firing on all cylinders with “XIII,” the lead single. Despite being a fantastically catchy track in its own right, a fun bit of trivia is knowing that this and 2 other songs on the album were written for inclusion in Friday the 13th: The Game. And although Ruff Justice has several soundtrack songs, they don’t break the flow of the album at any point – in fact, the tracks could easily blend into any of the Crazy Lixx catalog. To prove this point, stuck smack dab in the middle of the track list is yet another soundtrack song, “Killer.” Opening with a slow, brooding acoustic guitar, you can almost picture yourself wandering through the foggy, dense woods, trying to make your way to safety. Before you know it, the song launches into a full-on headbanger. Arguably the standout track on the record, “Killer” is one of many examples of Crazy Lixx straying from their feel-good, party boy roots, to something a bit more substantial in theme. Ruff Justice is proof that even when Crazy Lixx was down, they were far from out. In every song, I hear the influences of their forefathers. There’s a little bit of Ratt in “Walk the Wire,” a touch of Bon Jovi in “Live Before I Die,” long-time vocalist Danny Rexon seems to channel the great Kip Winger at times (especially in “Hunter of the Heart”), and guitarists Chrisse Olsson and Jens Lundgren have the chops to take on any of their guitar heroes. 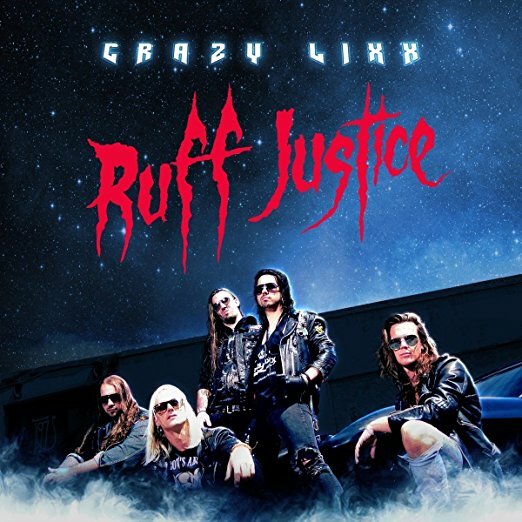 However, at the end of the day, Crazy Lixx has a sound that is uniquely theirs, and it shines on Ruff Justice. This is their best album since their major label debut New Religion, and I would proudly recommend it to anyone that enjoys a little rock n’ roll.